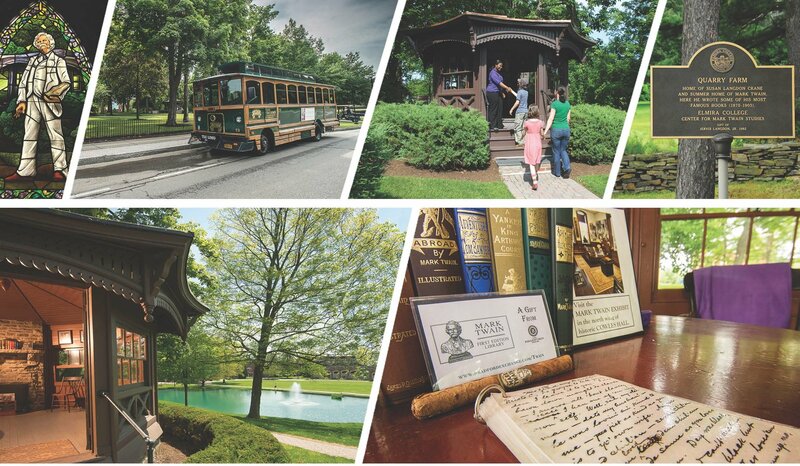 We invite you to delve into the magnificent countryside where Mark Twain drew the inspiration to write his literary classics, including The Adventures of Tom Sawyer and Adventures of Huckleberry Finn. Mark Twain became a fixture in the Elmira community when he married Elmira native Olivia Langdon in 1870. The couple and their children spent more than twenty years summering at Quarry Farm, the home of Olivia’s sister, Susan Crane, and it was here that he wrote much of his work in the octagonal study built expressly for him. Twain’s study was located a short walk from the main house and overlooked the serpentine Chemung River, whose waters were said to have an inspirational effect on Twain. Roughing It, The Adventures of Tom Sawyer, Adventures of Huckleberry Finn, The Prince and the Pauper, A Tramp Abroad, Life on the Mississippi, and A Connecticut Yankee in King Arthur’s Court as well as many shorter pieces were worked on during these many summers. Twain referred to Elmira as “a foretaste of Heaven” and although a citizen of the world, it was here in Elmira he was laid to rest alongside his wife’s family in their plot at Woodlawn Cemetery after his death on April 21, 1910 in Redding, CT. Twain’s grave is marked by a headstone and also a twelve foot tall- two fathoms or “mark twain”- granite monument. Visitors to Twain’s grave have been known to leave cigars in his honor. Twain’s famous study, the “number one literary attraction in America” according to USA Today, can be found on the campus of Elmira College. Modeled after a Mississippi steamboat pilot house, Twain described it as “the loveliest study you ever saw. It is octagonal in shape with a peaked roof, each space filled with a spacious window and it sits perched in complete isolation on the very top of an elevation that commands leagues of valleys and city and retreating ranges of blue hill.” Visitors will also find the Mark Twain Exhibit in Cowles Hall and statues of Mark Twain and his wife, Olivia Langdon, on the beautiful Victorian and Collegiate Gothic architecturally styled campus. The Center for Mark Twain Studies hosts “The Trouble Begins At Eight” lecture series annually in the Fall and Spring with visiting scholars presenting their take on all things Twain at The Barn of Quarry Farm. Twain’s legacy may be explored further by a visit to The Chemung Valley History Museum in downtown Elmira and during special lectures and events occurring throughout the year.